34th and Union. I’ve been to this corner 100 times. A quaint little spot with clean streets, big hanging flower baskets, wine bars and pricey brunch locales. I’ve been here as an employee, a diner, a cyclist, a coffee-shop writer and a shopper. Today I’m here as a student. For the next two hours, I’ll be studying history; one “you won’t find in history books” as one of the tour organizers said. 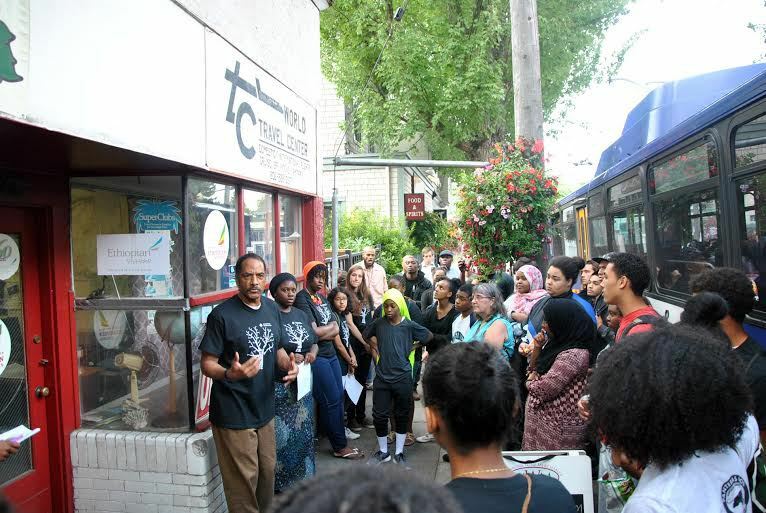 I’ve come today to learn about the Black Panther Party in Seattle directly from its founder and captain, Aaron Dixon, as we walk the streets where these events took place. Today, I’m a minority as measured by both age and race. Of the 40 people gathered together this balmy Wednesday afternoon, I am one of only a handful of white people and those over 30. Overwhelmingly, this crowd is young and black. We cross 34th Avenue with the awkward, slow swagger of a large group on a small sidewalk – made all the more awkward by our racial and age composition. Forty years ago, this area was one of the few in the city where black people were allowed to live but today it is dominated by people like me: white folks with large incomes. I can’t help but wonder what the passersby and business owners think of this crew – a group which would have been quite at home in 1965 but in 2015 stands out like a sore thumb. We maneuver under the impossibly large flower baskets suspended every few feet and stop in front of an unassuming 1 story building just south of Union Street. Mr. Dixon stands under the alcove and we are encouraged to gather in close to hear him better. Though a tall man, Aaron Dixon is somehow unassuming; his gentle demeanor in seeming contrast to the fiery passion of his youth. “This building was the first office for the Black Panther Party in Seattle,” he begins. His voice is firm and clear, but surprisingly soft. I take a step closer to the young man in front of me, straining to catch every word. I glance around and see my own attentive eagerness reflected on the faces around me: every neck craning, every eye focused on this man – so imposing historically; so mellow in person. 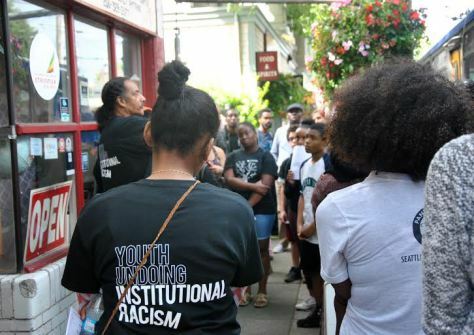 For the young people gathered here, in their matching black t-shirts with a white tree silhouetted on the front, this tour is the culmination of the Tyree Scott Freedom School where students spend 3-10 days discussing “…issues of institutional racism, systemic poverty, and the prison-industrial complex, and…learn[ing] organizing skills to tackle these issues.” There’s a bit of the “end of camp” feel to this group; bonded to each other from their shared experience and also something of the empowered; a quiet strength born of naming together the reality of racism and tracing its powerful force in the lives of black people for generations. Mr. Dixon and the youth gathered there were beginning from this shared history and shared knowledge. I, on the other hand, knew very little about Aaron Dixon and the Black Panther Party. Like most white folks (I’d wager) my previous knowledge of the Black Power movement in the late 1960s amounted to a vague notion that these activists were the violent, unruly side of the civil rights movement, misguided and inferior to Dr. King and other non-violent efforts. This simplistic and ignorant notion was blasted to pieces as I listened to Mr. Dixon, my uninformed assumptions revealed and revoked. We stood with this statement hanging in the air. Some shaking our heads and clucking our tongues in sadness and frustration. Others snapping their fingers in agreement and “mm-hmmming”. All of us heavy with this reality. And while the current relevancy is infuriating, the historical document itself is quite compelling. The 10 Point Program is a manifesto of great value, carefully crafted by deep thinkers to express their rights and demand equality. It is no accident, I’m sure, that the 10 Point Program’s tone and language are reminiscent of the Constitution of the United States of America. Yet, none of my political science courses in college covered the critical thinking and political philosophy of the Black Power movement – as though old white men in white wigs were they only ones capable of meaningful political thought. It struck me that the 10 Point Programs’ authors were clearly equals to the authors of the Constitution. And, to my mind, their reasons for revolt were far more legitimate. In addition to the force and lucidity of their policy, I was impressed by the discipline and commitment of the young men and women of the Seattle Black Panther Party. I had somehow been under the impression that the BPP was just a disorganized gang running around willy nilly shooting at people at random. This lame assumption could not have been further from the truth. The Seattle Black Panther Party was extremely disciplined – the members’ daily lives resembled boot camp more than anything else – with every moment of the day allotted to military drills, community service, personal education and planning meetings. And, remember, these young men and women were extremely young: between the ages of 14-19. Developmentally, we expect people at this age to be, for the most part, self-centered, lazy and unmotivated. But instead of sleeping in and sitting around, these young Black Panthers invested themselves entirely in the movement: submitting to discipline, living with structure and adhering to community rules. As I considered the radical commitment of these remarkable young Black Panthers, I couldn’t stop noticing the group of young black people around me and their rapt attention and focus. In the entire 1.5 hours we stood on the concrete listening to Mr. Dixon, I observed no one texting; no one giggling; no one distractedly picking at their hair or their friends’ sweater. I know enough about teenagers to know that this is remarkable. But I didn’t quite know why. Dustin Washington, director of the American Friends Service Committee’s Community Justice Program, which organizes the Freedom School, enlightened me. I suggested perhaps it was simply the high caliber of young people Freedom School attracts or that Freedom School trains them up in this manner. Mr. Washington affirmed these two ideas but added another more powerful reason. Washington said the students’ respectful attention was the result of their deep desire for truth and personal knowledge of the seriousness of the struggle. Aaron indeed brought the truth and these young men and women were certainly magnetized to it. These young people are pursuing truth, justice and transformation with a seriousness and a clarity well beyond their years. As an outsider in every way, I speak as one on the edges looking in. But from where I stood, the conviction, insight and preparedness I witnessed in that group looked a lot like another group of young people I’d recently heard a lot about. A group of young men and women in black berets in 1968. And I wasn’t the only one who thought so. One of Mr. Dixon’s final comments was in praise of the young people gathered there. He asked everyone in attendance to raise their hand if they’d been involved in the No New Youth Jail campaign. Virtually every hand went up. Mr. Dixon then applauded us saying the momentum, force and unity of that campaign was staggering and evidenced a powerful movement growing among the youth of color in Seattle. “It’s been 40 years since I’ve seen anything like that,” he concluded. Aaron Dixon and his compatriots in 1968 did something extraordinary. They stood up to a system that held their people down for generations and refused to submit; they said “No More!” with a power, discipline and clarity the like of which I’d never before encountered. Except that, as I become more aware, I’m beginning to experience that same power flourishing all around this community. I see it in the faces of the young people gathered together on 34th and Union that day. I hear it in the Freedom School and the tenacious, articulate and bold young leaders it is helping to shape. I feel it in the exponentially powerful union of these young people coming together to learn from a revered and incomparable elder in the struggle. Forty years ago it was the Black Panther Party. What will they be called today? What name will personify this new swell of pride and discipline; commitment and clarity; unity and gravity? I can’t begin to guess at the name nor how they will be remembered in history books 40 years from now. But I am confident a powerful movement will rise from the group I stood with on Wednesday. And I am confident that it will change the world. If you’re interested in more of this compelling history, get your hands on Aaron Dixon’s memoir, My People Are Rising. I cannot recommend it highly enough. Marilee Jolin writes a regular column for the Emerald. She currently lives in Beacon Hill, Seattle, Wash., with her husband and two daughters. This was originally published by the author by South Seattle Emerald. It should be noted that Aaron Dixon came and spoke in Utica in 2014 on a speaking tour in Upstate NY. Next PostWill Bernie Sanders’ ‘Soft Atheism’ Hurt His Chances?